This vegan burrito bowl is a far cry from Chipotle's recipe. My secret ingredients? Green chile cashew cream and crispy tortilla strips on top! Over the years of posting here, I’ve come to learn that Cinco de Mayo is celebrated more here in the States than it is in Mexico. So with that in mind, I’m bringing you this delicious (and completely inauthentic) vegan burrito bowl recipe. Plus, I can’t think of anything that represents America-mex as much as a burrito bowl, can you? This is no chain-restaurant burrito bowl. We’re going heavy on the veg today with cauliflower “rice” instead of regular rice. I have to warn you, this is a very veggie meal. If this cauliflower rice-in-quotation-marks scares you (or you don’t think your family will go for it), my suggestion is to take a baby step by mixing the cauliflower “rice” with equal parts cooked regular rice or quinoa. If you’re going the all-cauliflower route – you need to do what we did, which was pile your “rice” with tons of delicious toppings. You can make this sauce ahead of time and keep it in your fridge for about 4 days. The recipe makes extra, and it’s delicious on tacos, sandwiches… you get the idea. For crunch, I add crispy baked corn tortilla strips to this vegan burrito bowl recipe. I suggest not skipping this step: these really help the texture of this bowl since the other ingredients are all pretty soft. 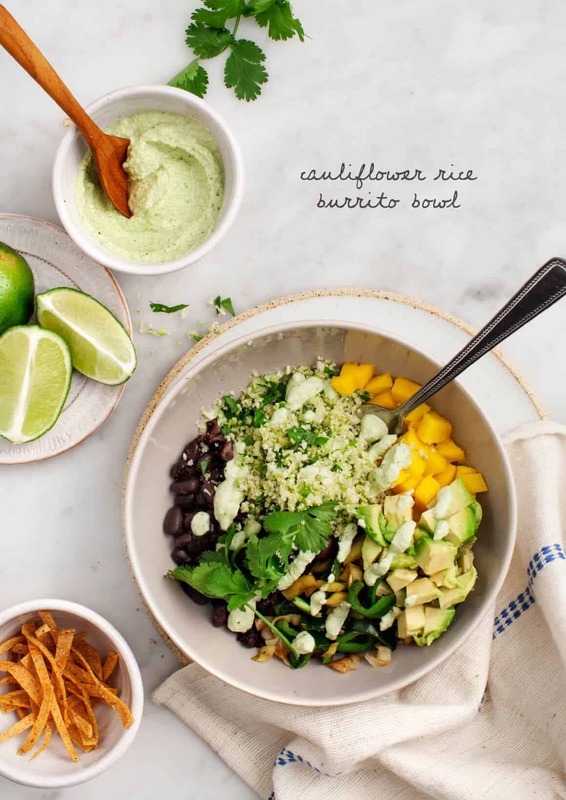 This bowl is pretty versatile – see the recipe notes below with suggestions for other veggies – roasted sweet potatoes would be delicious here, as would pico de gallo, this creamy chipotle sauce, or really whatever you like on your burrito bowl! Also – don’t forget that tomorrow is the last day to enter our Vitamix giveaway! It’ll make your green chile cashew cream that much creamier. 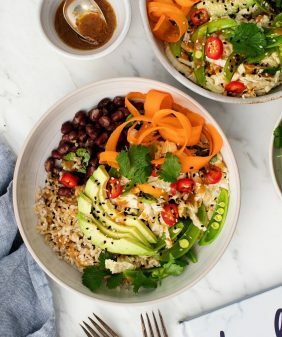 This vegan burrito bowl is one of my favorite meals when I'm in need of a healthy reset. It's gluten-free, and though it's mostly veggies, the cashew cream sauce and fresh cilantro pack it with flavor. Make the cashew cream. In a blender, combine the cashews, green chiles, scallion, cilantro, garlic, lime juice, water, and a pinch of salt and pepper. Blend well and season to taste. Add additional water if necessary to get your blender blade moving. Chill until ready to use. Preheat the oven to 350°F and line a baking sheet with parchment paper. Place the tortilla strips on the baking sheet and toss with a drizzle of olive oil and a pinch of salt. Bake for 10 minutes or until crispy. Remove from the oven and set aside. Make sure your cauliflower is fully dry. Place the cauliflower in a food processor and pulse until it has the texture of rice. Work in batches if necessary and don’t over process or it will get mushy. In a large skillet, heat 1 teaspoon of olive oil over medium heat. Add the cauliflower and sauté until heated through, about 5 minutes. Season with salt, pepper, and a squeeze of lime juice to help remove any bitterness from the raw cauliflower. 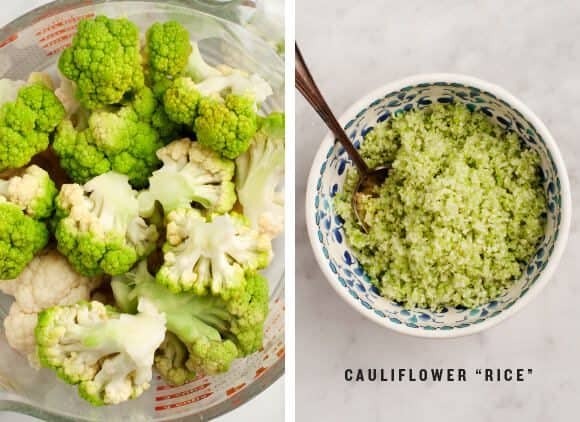 Skip this step if you prefer raw cauliflower rice. Remove from the skillet and portion the “rice” into 4 serving bowls. In a medium skillet, heat 1 teaspoon of olive oil over medium heat. Sauté the leeks and poblanos with generous pinches of salt and pepper. Cook until soft for 7 to 10 minutes, and then add the minced garlic and oregano. Stir, cook for 1 minute, then add a squeeze of lime and remove from heat. Distribute among the bowls. To the bowls add the black beans, mango, avocado, and cilantro. 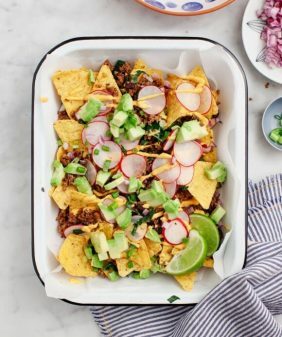 Top with the crispy tortilla strips and serve with the green sauce and extra lime wedges. Other vegetables that would be good here: chopped tomato, grilled corn, chicken or baked tofu, and roasted sweet potatoes. If raw cauliflower is too veggie for you, mix the cauliflower “rice” with equal parts cooked rice or quinoa. This looks so healthy and delicious! I am making it my goal to start making incredible lunches like this from now on! Cinco de Mayo is when the Mexicans defeated Napoleon’s forces. All the same, as a devotee of Mexican cuisine in a town with none, I am having Cinco de Mayo this year for two dozen French friends (it falls on a French holiday)–bygones are bygones as long as the food is good. Yum yum!! Just the thing to entice my son into giving burritos bowls a try! One of his favorite places to eat is at Chipolte…I think I’ll start him on the rice instead of cauliflower rice thought 😉 Thank you for sharing. Love your blog! thanks Danielle! This would be so delicious with regular rice, I hope he likes the bowls! I just made a burrito bowl for lunch today and I was thinking, with all this rice it’s still kind-of carb heavy. This is the perfect solution. Thanks! Of course you’d come up with the ultimate burrito bowl! Absolutely love this version. Also So true what you say about Austin. I’m from the area and also went to UT, and I miss the Mexican food and how common tacos, salsa, tortillas, etc are in the culture of shops, restaurants and markets there. Gotta make it all myself here in Switzerland. 😉 So I always appreciate your recipe inspiration! I tried this recipe last night! I have to admit I was HIGHLY skeptical of the cauliflower rice, but I gave it a shot and it was fantastic! Filling and tasty and didn’t feel at all like I was depriving myself. My husband has already requested it again. Thanks so much for sharing this! Hi Arielle – I’m so glad to hear that it was a hit! This looks sooo good! I heard so much about cauliflower rice but i’ve never tried it. I really need to do it as soon as possible! Thanks for sharing this recipe!! My three year old LOVES rice but it’s so hard to get her to eat veggies. Cauliflower rice to the rescue! Thank you!! Made it for supper tonight. It was yummy! Didn’t change a thing except oranges instead of mangoes. Since mangoes at store were hard 🙁 Otherwise so good.. Yum!! I love the idea of using cauliflower rice! I made this for dinner tonight and it will definitely be in regular rotation in the future. I recently switched my diet to be primarily plant based and your site and new cookbook have made every meal so delicious. 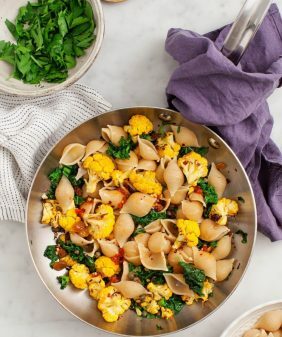 I haven’t been able to find raw cashews at my local grocery store – is there a big difference if I use roasted unsalted cashews in recipes like this? I haven’t made a cashew cream before tonight. Hi Kelly, I’m so happy to hear that! The difference is that the sauce with raw cashews won’t taste like cashews at all – they just have a neutral creamy flavor when blended. Roasted cashews will make the sauce have more of a cashew-like taste. Just made this for dinner. Can be served warm or cold. It tastes good either way. I’m trying to convince my family to eat a more plant-based diet and recipes like this are definitely doing the job. Thank you so much for creating and posting this delicious recipe! Hi Jeanine! Not too big on green chiles – is there a sub you’d recommend, or can they just be left out? Hi Kelli, you can just leave them out. Maybe add more lime, to taste, if it’s not tangy enough. Thanks for the speedy reply! Will do. Just wanted to report back and say that adding more lime in place of the chiles worked out great. The cashew cream is SO good and I’ve been using the rest of it on my lunches all week. Made this tonight, SO freaking good! Every recipe of yours that I’ve tried has been delicious, but I have to say this is my favorite so far. Very, very good, thank you! Hi Cassie, so sorry for my slow reply – I’m so happy you’ve been enjoying the recipes! I made this last night for my in-laws who are not vegetarian. Everyone was happy. I made this Sunday night for my in-laws who are not even vegetarian. Everyone was happy! Yay – I’m so glad everyone like it! I love Cauliflower rice and am always looking for creative ways to eat it for dinner. 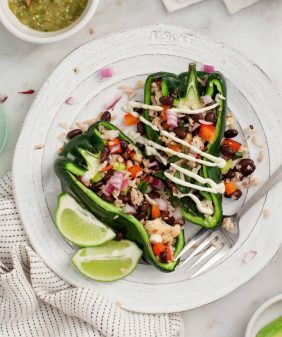 Can’t go wrong with some avocado and black beans for a healthy, weeknight meal combo! Great recipe! My husband is a picky meat eater and wouldn’t stop talking how good this dish was. Thanks for sharing this recipe! Yay, I’m so glad!! Thanks for coming back to comment! Thank you for this recipe – it was a total winner! Whole family loved it. We used the leftover cashew cream on a green salad the next day – YUM! Your blog/recipes have been fabulous, as I now need to cook gluten & dairy free for my daughter. Just ordered your book! Can’t wait to read through it. I made a few minor adjustments to recipe: only used 1 poblano b/c one family member doesn’t like things too spicy; added a cup of cooked quinoa to the cauliflower rice (we have not had cauliflower rice yet, so wasn’t sure what they would think). Didn’t use oregano b/c I didn’t have any. I also topped with some grilled chicken. AMAZING! Could I possibly replace the soaked cashews with soaked sunflower or pumpkin seeds? Hi Talia – yes, you can use raw sunflower seeds! I usually have to add more water when using sunflower seeds – I’d start with the amount listed here and if your blender gets stuck, add more water until they can blend smoothly. What other of your recipes do you recommend that will go with the cashew cream? I’m planning to make your vegan cauliflower stuffed poblano peppers tomorrow, and realize I made way more of the cashew cream than I needed. Thanks in advance for additional ideas!! Hello lovelies! I just came across your beautiful blog this am – I’m already hooked! I love your approach to health without worry about vegan, vegetarian etc, just wholesome goodness that seems to be mostly plant based and not judgmental, only inspirational. We need more of this! 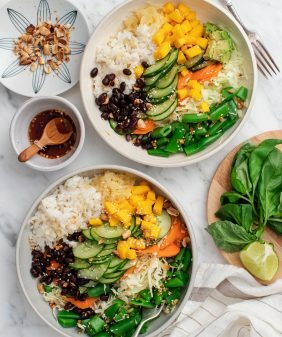 Totally going to share this easy Lunch Bowl post with my wellness community. Hello! Just curious – any way to sub cashew for any non-nut? This looks amazing but my fiance is allergic to peanuts/tree nuts. Thanks! 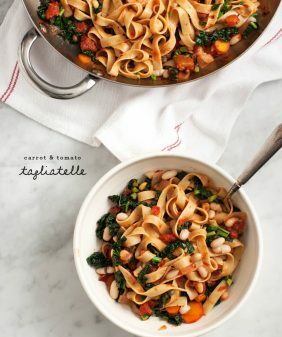 Made this for dinner tonight and love the balance of flavorable and textures! Definitely another delicious meal! Thanks for making cooking and meal planning such a joy! Delicious! AND amazingly I found every single ingredient at my local Trader Joes–it’s literally the world’s smallest TJs (it says so on the front door), so for an awesome recipe like this I often have to make a second stop somewhere else for the slightly more hard to find ingredients. Okay that was a lie, there weren’t any poblano peppers. However I subbed in jalapenos and they tasted great and weren’t too spicy. I just sauteed them for a little longer than the recipe suggests to make sure I got rid of some of the extra spiciness (I’m a baby about spice). I also quick soaked the cashews (brought to a boil and then let them sit in the hot water for about 20 min) and they blended pretty nicely in my 6 year old not very fancy ninja blender (I’ve lost the food processor attachment at this point). Thanks for another great recipe!